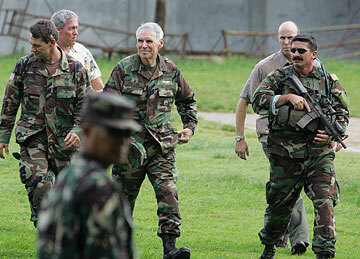 Under heavy security, Adm. William Fallon, center, commander of U.S. Forces in the Pacific, arrives at the Muslim extremist Abu Sayyaf stronghold of Jolo in the southern Philippines to visit American troops who are battling terrorism by treating the sick and helping build roads and schools. Adm. William Fallon had recently arrived in the islands to head U.S. forces in the Pacific when he asked former world surfing champion and state Sen. Fred Hemmings for lessons on how to ride the waves. "I was awfully impressed that a man that's in his 60s, as I am, would have the wisdom and the youthful spirit to take up surfing," Hemmings said. Defense Secretary Robert Gates on Friday cited Fallon's willingness to try new things as one reason for the 62-year-old Navy officer to assume one of the world's toughest jobs: command U.S. troops in the Middle East as they battle insurgencies in Iraq and Afghanistan. "Fox Fallon is one of the best strategic thinkers in uniform today, and his reputation for innovation is without peer," Gates said in a statement, using the naval aviator's call sign. Gates also praised the admiral's "strategic vision." Friends and former colleagues of Fallon's say his broad experience in senior military positions, along with his judgment and intelligence, make him a good choice. In the Pacific, Fallon has been an active diplomat, frequently boarding his Air Force-issued corporate jet to fly around the region for meetings with military counterparts and heads of state from India to Indonesia and Mongolia to Malaysia. He's spearheaded a major push to revive exchanges with China's military that were largely cut off after a U.S. spy plane collided with a Chinese fighter jet in 2001. Fallon said Chinese and U.S. officers need to understand one another better to avoid potentially disastrous miscalculations by two of the world's biggest military powers, pushing ahead with the program despite criticism from some in the Pentagon. In the Philippines, hundreds of U.S. Special Forces troops under his command have been training and equipping local soldiers as they battle insurgents and al-Qaida-linked terrorists. The troops, joined by aid workers, have also been building schools, repairing roads, and providing medical care to local residents in an effort to isolate the Philippine-based terrorists. Fallon has not spoken on how he would fight insurgents in Iraq and Afghanistan. But he told the Associated Press in an interview in June that terrorists in the Philippines needed to be defeated from a variety of angles. "You can only make so much progress in pure military means to solve this problem. There are underlying issues that have to be addressed -- economic issues, social issues -- with the populations," Fallon said. "You've got to work both sides of the problem. You've got to work the military side, to keep pressure on the bad guys. At the same time, we're trying to work the humanitarian, economic side." Building infrastructure for local residents was vital, Fallon said, to "wean them away from the siren song, if you will, of the terrorists." U.S. and Philippine troops are trying to replicate the success they've had running terrorists off the island of Basilan by using similar tactics in other insurgent-infested areas nearby, like Jolo island. Retired Adm. Walter Doran, who has known Fallon since they were both Navy ROTC cadets at Villanova University in the 1960s, said Fallon's two years heading the Pacific Command should eliminate worries about a Navy admiral's ability to lead a ground war. At Camp Smith, Fallon wears a so-called "purple suit" as a commander of Army, Air Force, Marine and Navy units. "Putting him in a position of joint leadership will not be a new experience for Bill Fallon," said Doran, who is now an executive at defense contractor Raytheon Co. "He's doing that right now." He added that Fallon's extensive experience in senior leadership roles, from his Pentagon stint as the deputy to the Navy's top officer to his leadership at the Fleet Forces Command in Norfolk, Va., prepared him well to lead the Central Command. He also flew combat missions during the Vietnam War. Hemmings said Fallon has displayed intelligence, loyalty and courage, all qualities one might expect in a military commander. But it is his keen sensitivity to those around him that sets him apart, said Hemmings, a Republican who represents Lanikai and Waimanalo. "In the course of our friendship, I could sense that he genuinely was sensitive to me as a person, to who I am, my roots and background," Hemmings said. "It's a tremendous asset in any human being, much less a military leader."